a while ago fellow ssg pete started telling the rest of us (and anyone else who would listen) about how good this new guy on modern love, andy stott, was. it took me a while to get on board, but since then i've been happily sailing with HMAS stott (hmm perhaps taking the 'on board' analogy a bit too far). the quality and depth of his output, especially given that he is a relative newcomer, is seriously impressive. what really grabs me about stott's productions is that they have a gravity, a certain weight to them, which give all his records a very distinctive and powerful feel. his sound manages to convey something quite unique and special. and now for the good news. a livepa of his has just been released. this is the first live recording of his i've come across, the only other one being the RA podcast with claro. having just finished listening to it, this has confirmed my impression that stott is definitely one of the best producers going about at the moment. and considering that at moments this recording struggles to deal with the bass (or that could be my soundcard), i am sure his livepa would sound amazing live. the recording is from the excellent club transmediale festival, held every february (i think) in berlin and definitely worth checking if you are about - good, forward thinking people and program. this is from a livestream over at samurai.fm. they've got a couple of other gems from transmediale up including a full livepa from prosumer and murat tepeli. will try and get an mp3 version of that soon too. in the meantime, get on board and enjoy some of the stott! i forgot to add - the volume levels on this recording might be a tad low. the mp3 is fine, but if anyone comes across a better recording and/or one of the prosumer + tepeli set, please post it! Loved this guy ever since I played Merciless for the first time. What a fantastic album. Modern Love - what a great label too. Thanks ssgs for bringing this new mix to the surface - cant wait to listen! yessir ! 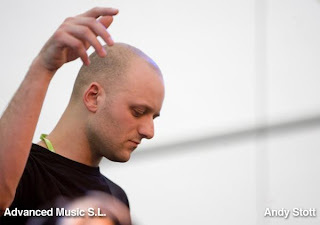 couldn't agree more andy stott is a badman. Indeed. He's playing for us in Brighton this Saturday night if any UK-based readers want to check him out. @ 2/1: the reason thing totally puts paid to the whole 'analog vs. digital' debate, don't you think? 'Cos yeah, they're such beautiful, crystaline, pristine and powerful sounds. NB Stott is just about to release a collection of his EPs. 2) GET the collection, it's dope. In a sense it does. Its all well and good when the likes of Stott and Claro can get such quality results out of using software but i would still say in order to get to their level it does take a conciderable amount of mastery. It can become very obvious when producers take the easy option with software and basically tweak a few presets. I tend to think if a producer has had to master an analogue equipment setup first then they can adapt to a software setup such as reason pretty comfortably while still retaining the dept that is gotten from using hardware. Thanks to this post I've been listening to Unknown Exception Vol. 1 and...it's phenomenal. I'd given 'Fear Of Heights' and 'Massacre' a cursory listen before but that's exactly how not to listen to this guy's music. It's superior to most of what i think of as seriously wishy-washy dub techno...this stuff really punches hard when it wants - 'pristine but powerful' is exactly right. there's real beauty too though. the Replace EP is now right near the top of my wantlist. thank you again to ssgs!